Enjoy a fun day catching your own scallops! Scalloping is fun for the whole family! Scalloping is not only my favorite past time from my childhood, it’s something that I enjoy doing as a captain every year. There is nothing better then hopping into the gin clear water of Homosassa and Crystal River in the dead heat of Summer! Get away from Everything that reminds you of home get in touch with mother nature all while catching the “Jewel of the Sea”! Q: When is scallop season? A: Scallop season starts July 1st and ends September 24th. Q: Can an inexperienced person catch scallops? 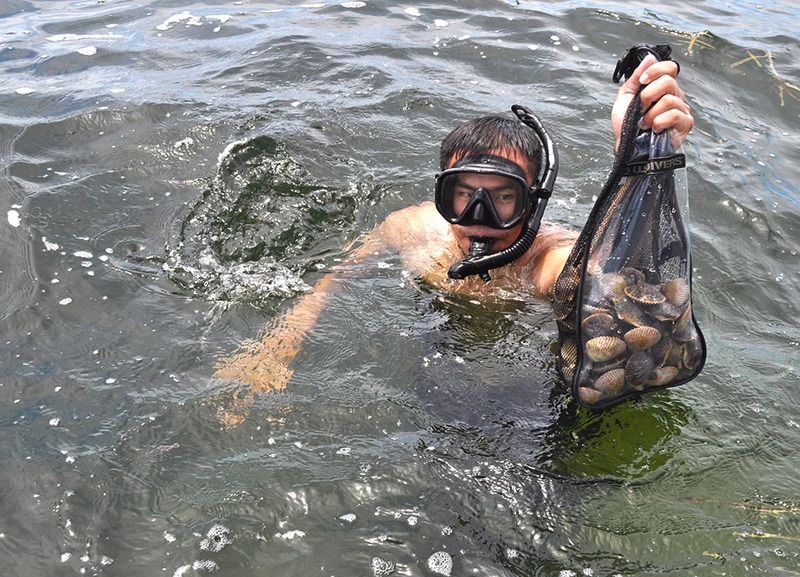 Q: How many people can I bring scalloping? A: I can accommodate up to six for a scalloping charter,Multi boat trips are available. Q: Do I need to bring my own snorkel, mask, and fins? A: No, I provide everything needed to have an enjoyable day on the water. Q: How many scallops are considered a limit of scallops? A: State law is a Maximum of 10 gallons of whole bay scallops in shell, or 1/2 gallon bay scallop meat per vessel. Q: What should I bring on my Scallop trip? A: You should bring sunscreen, Towels, food and drink for the day, and a great attitude. There’s no better way to beat the heat during the summer months than to go on a Homosassa scallop charter! This unique adventure includes so many fun things to do. Snorkeling for scallops, taking a scenic river tour, seeing wild animals, and then ending the day swimming in the cool freshwater Homosassa springs. The day starts around 8am with a scenic river cruise on our way out to the scalloping grounds. Once we hit the first scallop hot spot, we’ll throw on our snorkeling gear and jump in. The flats we’ll be on typically have very clear water and great visibility. Once in the water, you’ll be searching the bottom for those tasty scallops. When you see some, dive down, grab ’em and throw ’em in your bag. It’s that easy! After we’ve gathered our scallops, we’ll make a reverse trip back up the river towards Homosassa’s freshwater springs. On the way there we’ll stop and see the monkeys that reside on an island in the middle of the river and we’ll probably see dolphins, ospreys, and maybe even some manatees. When we get to the springs, you’ll be amazed at the electric blue color of the water and even more amazed at how cool and refreshing it is to swim in. There’s no better day to end a scallop charter than be refreshed by the cool, fresh water of Homosassa Springs. When we get back to the dock, the scallops will be cleaned and ready for you take take home and make a great meal.